The ear is a fascinating part of the human body. In a tiny amount of space, this organ contains several different sensory structures that provide not only hearing sensitivity, but regulate your sense of balance as well. The ear is made up of three parts: the outer, middle, and inner ear. The outer ear consists of the pinna or auricle, the visible portion of the ear, and the ear canal down to the eardrum, or tympanic membrane. The pinna is curved and folded to help direct sounds that are coming towards us from the front and sides to go directly down to the ear canal. The ear canal typically has two S-curves that help prevent water, foreign objects, or too much pressure from damaging the tympanic membrane while also slightly amplifying the incoming sound signal. The ear canal produces wax which helps moisturize and clear the canal of debris and dead skin cells. 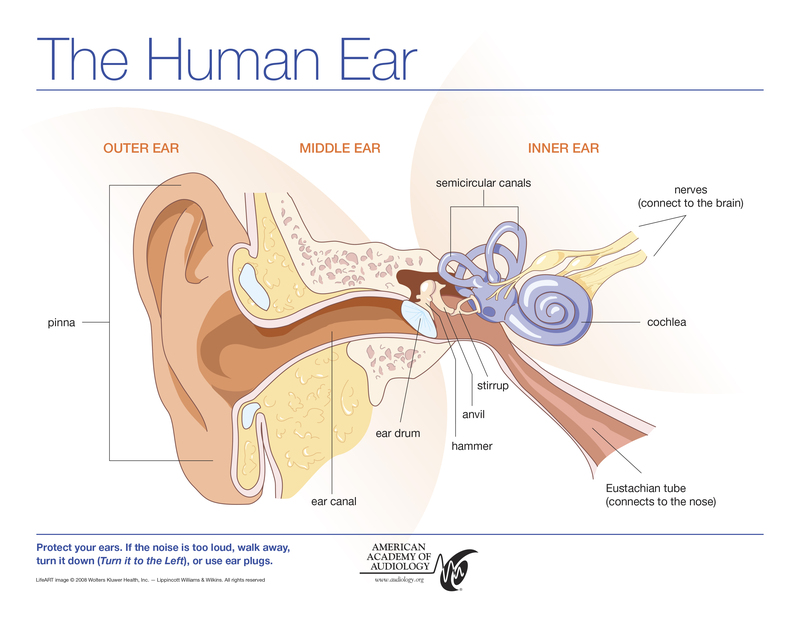 The tympanic membrane separates the outer from the middle ear, and is much like the skin of a drum. It is pulled just taunt enough that when sound energy reaches it, it will vibrate into the bones of the middle ear. The middle ear is a tiny cavity within the skull that houses the middle ear bones, or ossicles. Few people know the proper terms for these bones (malleus, incus, and stapes) but most know the English versions: hammer, anvil, and stirrup. The malleus (hammer) attaches to the tympanic membrane and the stapes (stirrup) attaches to the oval window on the cochlea (inner ear). The incus (anvil) bridges these two bones. These bones turn the soundwave energy caught and transferred by the tympanic membrane into mechanical energy by vibrating and moving with each other and pressing against the oval window of the cochlea. The inner ear is made up of the cochlea and semicircular canals, which are all embedded in the temporal bone of the skull. The cochlea is involved with hearing and the semicircular canals deal with balance. The cochlea is a snail-shaped, fluid-filled organ that contains stereocilia, or “hair cells.” These cells are not actually hair, but they look like it. When the ossicles push vibrations through the oval window of the cochlea, the fluid within the cochlea shifts like tiny waves and stimulates the hair cells (imagine seaweed moving with the surf). As the hair cells are stimulated, they send electrochemical impulses along to the auditory nerve, which takes the signals up to the brain to process. All in all, the ear is an incredibly specialized transducer that makes it possible for the brain to interpret sound. This occurs via the transformation of sound energy to mechanical energy to hydraulic energy to electrochemical energy, and all of this occurs countless times throughout the day. No wonder some of us get so tired when we’re in noisy environments! Fun Random Fact: Most “gargoyles” are not actually gargoyles; they are “grotesques.” A gargoyle is a grotesque that is specially carved to channel rain and act as gutters on roofs and balconies to protect the masonry of the building they are on. Gargoyles are based on a French mythological sea serpent called the Gargouille which spewed water.